Electronic cigarettes (“e-cigarettes”) are gaining popularity among adults and teens. E-cigarettes have replaceable cartridges of liquid containing nicotine. When a user turns on an e-cigarette, a heating element turns the liquid into a vapor that is inhaled. The liquid contains nicotine, which is addictive, and often flavors such as chocolate or types of fruit or candy. Manufacturers and advocates of e-cigarettes say they are a healthier alternative to tobacco smoking, because they do not contain hundreds of toxins that are released when tobacco cigarettes are burned. Meanwhile, critics of e-cigarettes worry that the vapor may pose health risks and may encourage people — including youth — to smoke tobacco cigarettes. E-cigarettes are not currently regulated by the US Food and Drug Administration (FDA), although the FDA has indicated that it plans to announce its plans regarding e-cigarettes in the near future. Meanwhile, several states have passed their own laws prohibiting sales of e-cigarettes to minors, and a few states have classified e-cigarettes as tobacco products. The C.S. Mott Children’s Hospital National Poll on Children’s Health first examined public views about e-cigarettes in 2010. In 2013, the Poll followed up by presenting arguments for and against e-cigarettes and then asking a national sample of adults for their opinions regarding e-cigarettes and possible regulations and laws. Overall, 86% of adults have heard of e-cigarettes in 2013, compared with only 37% in 2010. Only 13% have ever tried an e-cigarette, although that level is increased from just 3% in 2010. Two of every five adults (44%) think e-cigarettes will encourage tobacco use among youth. Nearly half of parents (48%) are either very or somewhat concerned that their children will try e-cigarettes. About two-thirds of adults (65%) think e-cigarettes should have health warnings like tobacco cigarettes and other tobacco-containing products. Adults express widespread support for new and potential laws regarding e-cigarettes: 88% think manufacturers should be required to test e-cigarettes for safety, and 86% favor prohibiting the sale of e-cigarettes to minors (Figure 1). 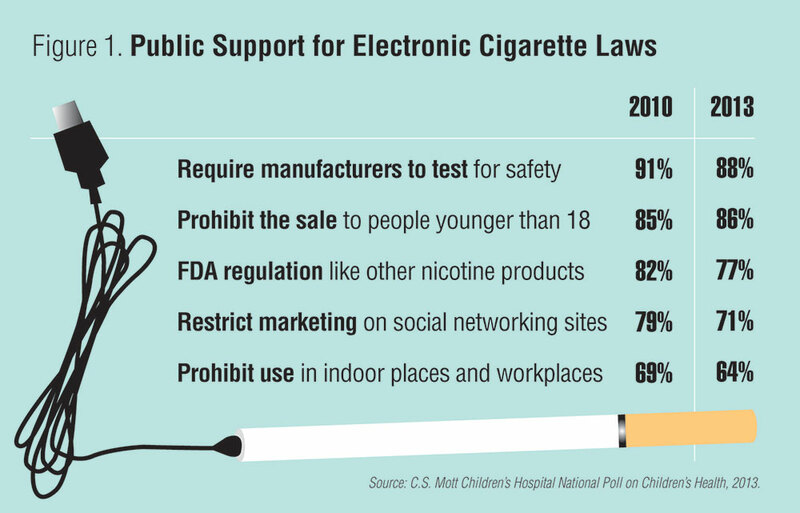 Large majorities also support FDA regulation of e-cigarettes like that of other nicotine-containing products, marketing restrictions on social networking sites often frequented by youth, and prohibition of e-cigarette use indoors. These levels of public support for regulations regarding e-cigarettes are similar to levels in 2010, although in the case of FDA regulation, restrictions on social marketing, and restricting use in indoor places not quite as high (Figure 1). Nearly two-thirds (63%) of adults support a tax on e-cigarettes, similar to taxes on tobacco cigarettes. 44% of adults believe e-cigarettes will encourage kids to use tobacco products. Nearly half of parents are concerned their child will try e-cigarettes. 86% of adults support prohibiting sale of e-cigarettes to youth under age 18. E-cigarettes remain a relatively new consumer product with little information about safety or long-term health effects. As in 2010, it is clear from this poll that US adults are not waiting for scientific evidence to shape their views about e-cigarettes. Even as e-cigarettes gain far more national awareness than just 3 years ago, the majority of the public supports several types of regulations of e-cigarettes based on potential risks – not just short-term health effects, but also the possibility that e-cigarettes may prompt youth to smoke tobacco cigarettes. These findings contribute to the ongoing public dialogue about e-cigarettes, which has prompted over half of states and the District of Columbia to consider and pass several laws regarding e-cigarettes just since the Poll addressed e-cigarettes in 2010. The majority of state laws about e-cigarettes have prohibited sales to minors, consistent with the very high level of public support for such restrictions. Another potential initiative to address public concerns about e-cigarettes – FDA regulation of the devices like other nicotine-containing products – is currently pending in Washington, with a decision expected soon. If the FDA decides to regulate e-cigarettes as nicotine-containing products, it can do so knowing that three-quarters of US adults would support such action. Public support was also high for the idea that manufacturers should be required to test e-cigarettes for safety, but it is not clear at this time whether such testing regulations or laws are being considered at federal or state levels. Meanwhile, although a handful of states have acted to prohibit use of e-cigarettes as part of their indoor air quality laws, such an approach (supported by about two-thirds of adults in this Poll) has not gained wide favor. This report presents findings from a nationally representative household survey conducted exclusively by GfK Custom Research, LLC (GfK), for C.S. Mott Children’s Hospital via a method used in many published studies. The survey was administered in November 2013 to a randomly selected, stratified group of adults age 18 and older (n=2,124) from GfK’s web-enabled KnowledgePanel® that closely resembles the U.S. population. The sample was subsequently weighted to reflect population figures from the Census Bureau. The survey completion rate was 61% among the panel members contacted to participate. The margin of error is ± 2 to 4 percentage points. Davis MM, Kauffman AD, Singer DC, Gebremariam A, Clark SJ. Adults worry e-cigarettes will encourage kids to start smoking tobacco. C.S. Mott Children's Hospital National Poll on Children's Health, University of Michigan. Vol 20, Issue 1, December 2013. Available at: http://mottpoll.org/reports-surveys/adults-worry-e-cigarettes-will-encourage-kids-start-smoking-tobacco.